GW Commercial Equipment are based in Dagenham supplying and installing commercial laundry equipment in Essex and Greater London. They supply the most reliable brands from Miele and Hobart to Primus and Classeq. GW Commercial Equipment supply and install industrial laundry equipment and commercial washing machines for a wide variety of sectors including hotels, hospitals, nursing homes, leisure providers and laundrettes. They also offer WetCare Cleaning Systems which are suitable for rugs, bags, suits, wedding dresses, shirts and lots of other garments. GW Commercial Equipment are leading installers with the reassurance of Gas Safe, CHAS and ISO accreditations. They have fantastic product reviews across the whole industrial laundry equipment range. 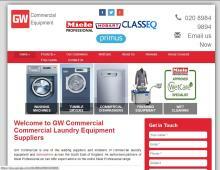 If you are looking for laundry equipment suppliers in London or Essex areas then contact GW Commercial today!